Cities Argue For a Bigger Share Of Pot Tax Revenue In Washington and Oregon, local governments argue they should get more tax funds from marijuana, because legalized pot will increase their expenses. States say cities' costs will actually fall. 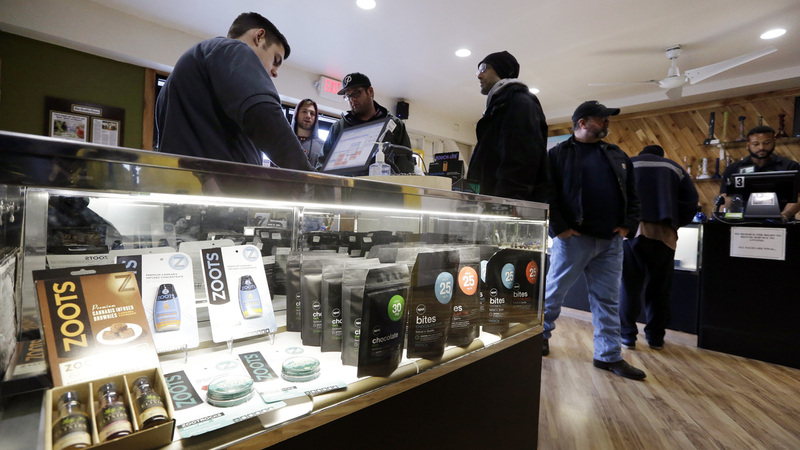 Customers browse the pot products at Cannabis City in Seattle. In Washington, the 2012 initiative to legalize pot was sold as a way to decrease expenses for local governments. When voters in four U.S. states — Colorado, Washington, Alaska and Oregon — approved recreational marijuana sales, part of the appeal was the promise of a new revenue source to buoy cash-strapped cities and states. But tensions are growing in those four states over how the tax rewards from pot sales should be divided. Local governments want to get what they say is their share of pot tax revenue. Under Oregon's new pot law, cities get 10 percent of the tax revenues. Even though the state's retail industry doesn't start until next year, city leaders are already saying their share is not nearly enough. "Somebody else thought they knew how much we were going to need," says Scott Winkels, lobbyist with the League of Oregon Cities. Winkels argues that if pot becomes more available, more people will use it and inevitably do something stupid — and cities will bear the costs, not the state. "We reasonably expect to see an increase in things like drug driving," he says. "How many neighborhood complaints to the city manager has the state dealt with because of odor? When that smoke comes wafting over the fence and somebody's upset that their kids are smelling it, who's going to take that call? It's going to be your local government." Winkels estimates roughly 70 cities in Oregon have passed a sales tax on retail pot, with the hope of bringing in additional revenues. But it's unclear whether those cities will be allowed to keep their sales taxes: Oregon's marijuana law contains a provision that specifically prohibits local governments from adding their own taxes. One state to the north, in Washington, the 2012 initiative to legalize pot was sold as a way to decrease expenses for local governments, says the ACLU's Alison Holcomb with the American Civil Liberties Union, who wrote the ballot proposal. Retail pot has been legal in the state since July. "The primary costs that cities were bearing from marijuana laws was the costs of criminal enforcement," Holcomb says. "The number of police officers that were having to process paperwork on marijuana charges, and the overwhelming majority of those marijuana charges being for simple possession." In 2011, the Washington State Patrol made nearly 7,000 misdemeanor drug arrests. Last year, that number dropped to 820. "So it's hard to see what the increased law enforcement cost is," she says. "It looks like it should be a decreased law enforcement cost." Holcomb acknowledges it's possible costs are up for local governments. But she quickly adds that she's still waiting for a municipality to come forward with a balance sheet that shows just what those costs are for. Meanwhile, in Colorado, local governments get a share of tax revenues from the retail pot industry — and that state has brought in so much tax money from pot, residents will be getting a refund. Alaska is still sorting out how it plans to divide tax revenue. Reuven Carlyle, a member of the Washington Legislature, says he's sympathetic to municipalities, but says the argument that pot costs cities more than it does states is a bit of a bait and switch. "The argument was made to the public and sold to the public that their costs were actually going to go down," Carlyle says. Carlyle says the revenue could help Washington comply with a state Supreme Court order to increase funding for education. Also, he says, cities in Washington haven't proven that their costs have increased. "We simply don't have data or evidence that their costs have been substantial," Carlyle says. Still, that's not stopping some lawmakers from trying. A bill just introduced in the Washington Legislature would give local governments one-third of the tax revenues from pot.